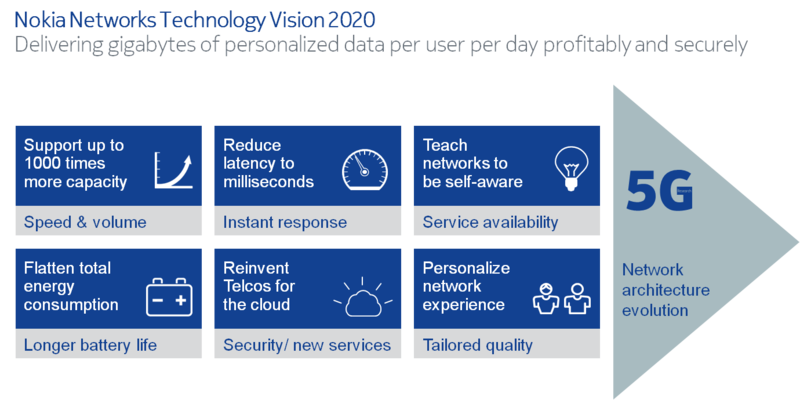 We are now two years into our Technology Vision 2020 - Nokia Networks' stepwise guide to enable mobile broadband networks to deliver gigabytes of personalized data per user per day by 2020. Our vision got big thumbs up from customers, partners and industry compatriots for its simplicity, comprehensiveness and clarity. In fact a few major operators invited Nokia exclusively to help build their own technology evolution path towards 2020. Competitors also complemented our vision by churning out their own versions, very much along the same lines! Nokia’s Technology Vision 2020 essentially laid a common foundation towards which the industry has gravitated since. In the meanwhile, we have been busy putting our vision to work and 2014 was an especially outstanding year in that context. To support 1000x capacity, we delivered many improvements to LTE standards, achieved 4.1 Gbps peak speed, implemented TDD-FDD carrier aggregation, commercialized the award winning Centralized RAN solution and successfully completed the first live trials of Authorized Shared Access and LTE for TV broadcast. In 2014, Nokia also made the first 5G delivery, with a 5G mm wave demonstrator for DoCoMo, apart from hosting the first annual 5G Brooklyn Summit! We took big steps towards reinventing telcos for the cloud, exemplified by, an extremely advanced SDN controlled network demo at MWC 2014, a proof of concept of Cloud RAN with a major North American operator, launch of Cloud Application manager and multiple NFV implementations. In cognitive networks that span both teaching networks to be self aware and personalizing network experience, we moved many new SON features to productization and introduced ‘Dynamic Experience Management’ which is the most advanced customer experience management solution in the world. Tons of new innovations based on big data, analytics and machine learning were realized, including the big hit Predictive Operations. Reducing latency to milliseconds continued to be a major area of innovation, where we led the creation of a new ETSI initiative around Mobile Edge Computing and took our unique Liquid Applications platform to the next level by launching the Liquid Apps factory. In 2014, we again put our ‘Outside-in and Open Innovation’ approach to practice, this time with the Silicon Valley Open Innovation Challenge. It served as an excellent platform to find new companies, startups and innovators to jointly work with us on problems of the future around Telco Cloud and Big data analytics. It’s been quite exciting to bring our vision to life piece by piece, and there are still 5 more years to go! While we keep our foot firmly on the accelerator towards 2020, it’s equally important to keep enhancing our vision to address the latest trends and developments. Machine to Machine, Internet of things, Security, Privacy, extensions of LTE such as LTE-M, LTE-U, Connected Cars and of course 5G, are major areas where the industry has been abuzz with both talk and action lately. Another big focus area for us is the overall architectural evolution to accommodate cloud based and cognitive networks. Until then, let's give two thousand and fifteen cheers to all the innovators who are helping bring Technology Vision 2020 to life! Please share your thoughts on this topic by replying below - and join the Twitter discussion with @NokiaNetworks using #NetworksPerform #mobilebroadband #5G #innovation #FutureWorks.